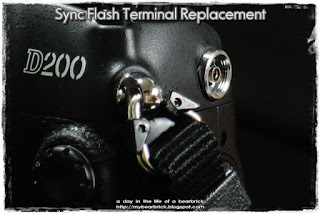 Last weekend, during one of my photo shoot outing, I realized that I have lost the Flash Sync Terminal cover for my Nikon D200 body. 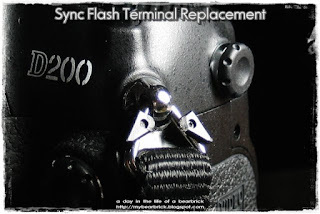 The Flash Sync Terminal is for synchronizing non-"SB" Speedlights to the camera via a sync cable. However, since I have been using an SB-600 Speedlight, I do not need to use the Flash Sync Terminal at all. Furthermore, the terminal cover is secured to the terminal via screw threads, hence there is no way this could have came loose and gotten misplaced. Nevertheless, unimaginable things can still happen to the most careful and meticulous person. I love my Nikon D200 too much to see it 'naked' and have a fetish for maintaining my equipment in its mint, pristine appearance. 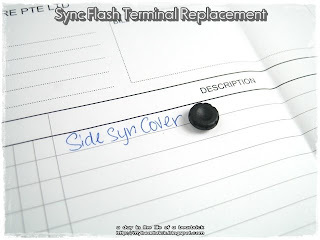 Thus, I had to find a replacement for the Flash Sync Terminal cover. I 'googled' for replacements and came up with websites that stock Nikon replacement parts (both original and after market), but they are all located in United States. I knew it was not going to easy to find since, this part does not have part number unlike the BS-1 Flash Hotshoe cover. Furthermore, this part is no longer in use in newer models Nikon DSLR. Though I have no qualms about getting one online, but a replacement will cost me $5 USD and with shipping that is gonna cost me more than S$10. 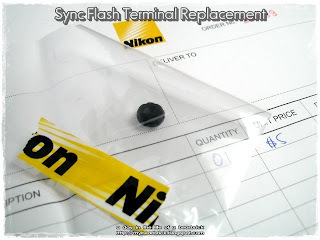 I then contacted Nikon Service Center (NSC) Singapore to enquire on a replacement. While awaiting reply from NSC, a few fellow Nikon users from forums suggested that I get it from a camera retailer in town; they stock and sell after-market replacements and will only cost me S$8, rather getting one from NSC which will cost me S$10. I decided to wait for NSC to give me a reply. I was delighted that NSC can provide me an original replacement at only S$5 (excl. GST)! NSC also reassured me that Nikon will continue to manufacture and provide replacement parts for discontinued models for 20 years. That is what I call service! That is why I choose Nikon! 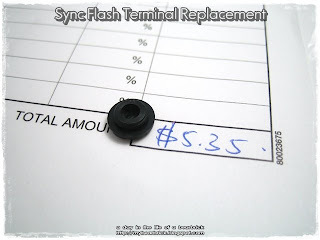 The Flash Sync Terminal cover is a small plastic cover that screws into terminal with 2 full turns. I still cannot believe it came loose from just normal handling! Do The Coundown and STARE! and this is what I am posting!? 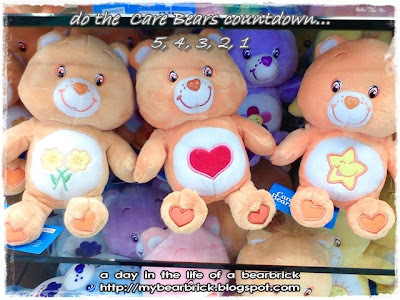 Nevertheless, any Care Bears fan will know that these Care Bears are not the same characters as the classic cartoon series. Hot Toys "IRON MAN™ MARK.I"
Previously there was the IRON MAN™ and IRON MAN™ Mark.II action figure from Hot Toys. Just when you thought it was going to end there, fans of the "IRON MAN™" movie can now collect the prototype that Tony Stark created when he was trapped in the cave. And another great headsculpt of Robert Downey Jr. as Tony Stark. WiFi recently celebrated their 28th birthdays and decided to pamper each other with some gifts that they really needed. 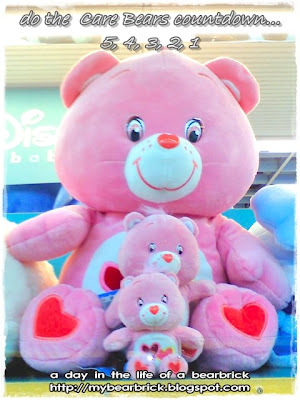 It is a gift exchange of one gift for two. Might not seem a fair exchange in anyways, but gifts are never to be judged by value. It is what makes the recipients happy. After all these are really useful gifts! I am really delighted to capture these moments of WiFi and share their special day here. Domo is a strange monster born from an egg. Despite its ferocious appearance, Domo is actually a friendly character who is known to fart repeatedly when it gets upset or nervous. So how is Domo being useful? It scares away stray dogs and possibly attract girls! Wahahaha! This Braun Buffel wallet is actually smaller than the normal wallet size. It is just slightly taller than a card holder. This unique size is chosen as it fits into a cardholder pocket. The design on the wallet is a big Braun Buffel iconic buffalo embossed into the black leather. Inside this gift, there is a token of ten S$50 notes which puzzles the recipient by its significance. A rather inexpensive GUCCI Borsa Abbey makes a perfect bag for everyday use. The Borsa Abbey is made with strong canvas that can last a decade, and in the trademark Original 'GG' Colour that is timeless. Every lady deserves an authentic GUCCI bag. Back in the days as early as the 15th Century, after the great Chinese explorer Admiral Zheng He made his first visit to the Malay Peninsula, the Emperor of China send a princess to the Sultan of Malacca. Followers of the princess who eventually settled and spreaded the roots into this region, became the first Straits-born Chinese, the Peranakan. Also known as Baba for man and Nonya for woman, the Peranakans are very much Chinese but adopted a Malay culture and language as a way of life. The Peranakans eventually grew to a population unique to this region of Asia, and the cultures and heritage, a gem. Kim Choo's Kitchen at Katong, is one restaurant and museum that welcomes diners into a Peranakan home where they indulge in a culture and heritage-rich taste. My wife and I visited Kim Choo's Kitchen during my birthday to celebrated this special day in Peranakan style. Achar, pickled cucumbers and carrots makes great appetizers. Sambal belachan tingles your palate with any Peranakan dish. Seeds from the pods of Parkia speciosa, petai, stir-fried with sambal chilli, anchovies and minced pork. Also known as 'stink bean', the petai dish is one love/hate dish. Calamari rings stir fried with sambal, chilli and shallots. A simple stir fried kailan dish with bailinggu mushrooms and ginger slices. A distinctive Peranakan dish of chicken (ayam) stir fried with sambal and 'black' nuts from the Pangium edule or kepayang tree. A special cutlery with a narrow spatula and a miniature fork on each ends, is used to retrieve the bitter tender flesh from within the nut. Kim Choo's Kitchen is not only a shophouse that serves Peranakan dishes and sells Nonya kuehs, but this two-storey conserved shophouse is a museum and gallery showcasing the culture of the Peranakans. Most items in the gallery are for retail. Coloured tableware, kerosene lamps and food baskets. The old skool meal boxes and a manual calculator. Unique Nonya outfits are still adored by and the pride of the modern generation of Peranakans. Kim Choo's Kitchen not only is a good place to dine, it is also a gallery of heritage. The prices of the food is reasonable. The authentic taste of the Peranakan dishes has been well-preserved. I would usually have petai stir-fried with sambal and minced ha bee (dried shrimps), but having it with minced pork makes this dish even better! The petai seeds are not overly cooked and retained its unique taste and crunchy texture when raw. The Ayam Buah Keluak dish is a must-try dish for anyone who visits Kim Choo's Kitchen. Though for many, it may seem like rendang, but the buah keluak made all the difference to the taste of this dish. Nevertheless, the flesh of this nut is a rather acquired taste. The excellent service and ambiance makes this restaurant a fantastic dining place for all occasions. Note that there is a charge for the achar and water, however, all listed prices are already inclusive of government taxes and service charges. My bill came up to S$36.70 and in my opinion gives me the same omph I get when I visited Tung Lok Signatures, except cheaper! Increasing Living Costs in "The Island"
As of the 1st of October 2008, the cost of living is increasing again as electricity bills are increased by 21% and public transport fares are increasing. This is probably one of the biggest hike among the chain of rampant fare hikes that took place this year. Employers are still not matching up the increment in wages during this period of stagflation. Has any employer gave more than one increment during this year? Does this mean we will now have to work at least 21% harder to pay off increment? Nevertheless, the 'one-off bonus packages' (which I call 'spending power' or 'tokens') buffered the increasing cost of living and pacified many. However, with the endless increasing number of temptations, such as the endless I.T. 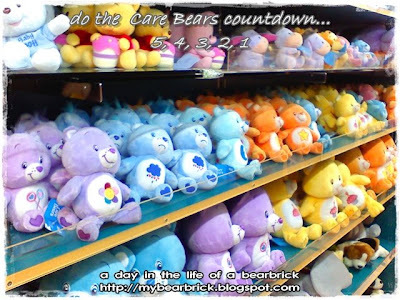 sales, a nicer but smaller and more expensive home, another baby in the family, cheaper cars, fancier fireworks displays, the recent F1 and the upcoming integrated resorts (IR), to motivate spending. If one does not expect these to be the luxuries of an average life, and live off S$1.90 nasi lemak for the rest of their life, they will probably find the package very useful. However, if most people are enjoying these luxuries as part of their normal life, the 'spending power' is probably not going to last more than a month. It is just like going to an amusement centre, where the difficulty levels are set to "Insane"; your 'tokens' are not going to last you through stage 1. As many people will soon or had already realise that our ultimate 'employers' are handing out our bonuses in one hand and taking them back in the other hand in an exponential rate. I cannot help but imagine 'cash cows' strapped to the necks by tight reins and with their udders constantly milked 24/7! Where are these 'milk' going to, when the 'cash cows' only see fancier upgrades in the daily factory with a new section called 'imported cash cows'. How are the 'calves' going to survive in the future? My resolution for this birthday is to device a strategy to escape from "The Island", like Ewan McGregor in the movie of the same title!